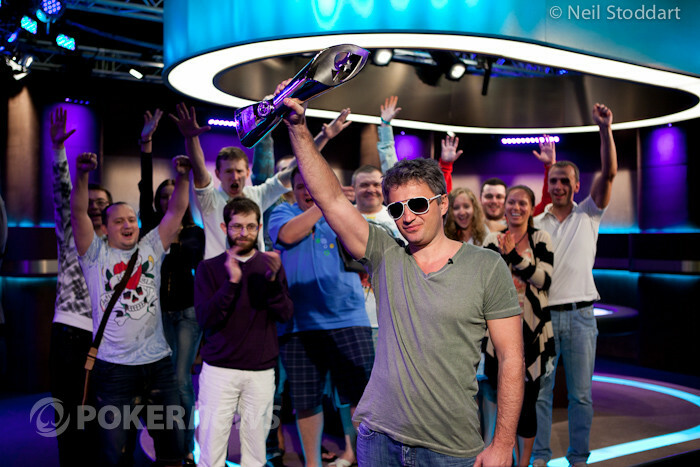 Congratulations to Leonid Bilokur, $25,000 High Roller Champion ($1,134,930)! 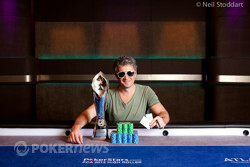 The 2012 PokerStars Caribbean Adventure $25,000 High Roller is all said and done. Coming out on top after besting a great final table was Leonid Bilokur. He'll walk away with the $1,134,930 first-place prize. 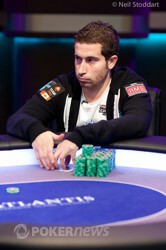 Bilokur came into the final table fourth in chips. He played very steady throughout the final table and some might say even a bit too tight at times. Despite what people may say, he played very solid and began to pick up more and more steam as other players at the table were eliminated. As play progressed, Bilokur began to pick up chips and open up his game. That proved to be the recipe for success as he soon found himself heads up against Team PokerStars Pro and 2010 World Series of Poker Main Event champion Jonathan Duhamel. Duhamel had eliminated start-of-the-day chip leader Jason Koon in fourth place and then Isaac Haxton in third place to set the stage for the heads-up match. When it began, Duhamel held the lead with 5.43 million in chips to 1.96 million for Bilokur. From there, Bilokur clawed and scratched to get himself right back into the mix before taking the lead over Duhamel. At one point on the commentary, it was mentioned by Barry Greenstein that Duhamel was simply trying to "outplay" Bilokur too much and that's what caused him to slip. On the final hand, it was Bilokur's versus Duhamel's all in preflop. The board ran out and Bilokur's full house was the winning hand. For his runner-up finish, Duhamel walked away with $634,550 in prize money and will add that to the $571,420 he's already collected from the 2012 PCA. He previously took fourth place finish in the $100,000 Super High Roller for $313,600. first place in the $5,000 No-Limit Hold'em for $239,830 and fifth in the $5,000 No-Limit Hold'em Turbo for $17,990. Congratulations to Bilokur for his victory and also to all of the other winners in the event. Next up on the PokerStars tours will be EPT Deauville at the end of the month, so be sure to follow along with all of PokerNews' coverage coming up. Photos courtesy of Neil Stoddart. Jonathan Duhamel - Eliminated in 2nd Place. Jonathan Duhamel opened to 120,000 on the button with , Bilokur three-bet to 325,000 with , and Duhamel four-bet shoved for 1.68 million. Bilokur tank-called. Duhamel was very unhappy that he was called, and leaned back in his chair as the flop came down . Bilokur's rail exploded. The ended the hand, and Bilokur was mobbed by several of his friends. The completed the board, giving Bilokur a full house for kicks and giggles, and eliminated Duhamel in second place. Team PokerStars Pro Jonathan Duhamel had a fantastic PCA, and after making four final tables, he'll return to Canada with over $1.1 million. Well done, Mr. Duhamel. From the button, Leonid Bilokur raised to 120,000. Jonathan Duhamel reraised to 350,000. Bilokur leaned over, checked Duhamel's stack and then moved all in. Duhamel quickly folded and Bilokur won the pot. Jonathan Duhamel limped in with , and Leonid Bilokur rapped the table like he was about to fold the , then checked when he realized that Duhamel had limped. The flop came down , Bilokur checked, Duhamel tossed out 75,000, and Bilokur called. Both players checked after the turned, and the completed the board. Bilokur led for 325,000, and Duhamel released. Jonathan Duhamel opened to 120,000 with , Leonid Bilokur three-bet to 325,000 with , and Duhamel called. The dealer fanned , and both players checked. The turned, and Bilokur led for 350,000. Duhamel called. The completed the board, and Bilokur led again - this time for 600,000. Duhamel mucked. On the button, Jonathan Duhamel raised to 120,000 with the . Leonid Bilokur called from the big blind with the and the flop came down . Bilokur checked and Duhamel bet 150,000. Bilokur quickly folded and Duhamel won the pot.